A computer virus is a program that spreads from one computer to another by replicating himself. Viruses are also known as malware which means malicious software. They are sent by a number of ways without the host knowing about it. These include email attachments, downloading from the internet and memory sticks. What damage can a computer virus do? They can cause computers to crash, reboot and cause millions if not billions of euro’s worth of damage to companies infected by a virus. What can anti-virus software do to stop this from happening? 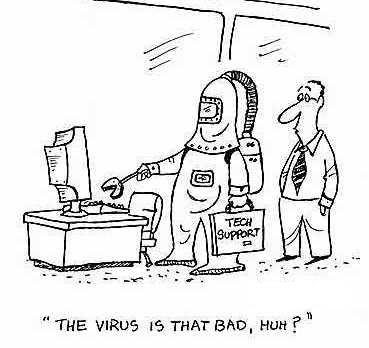 Anti- virus can perform automatic or manual scans of a computer to search for computer viruses. If it finds a virus the software it depends on the provider of how it deals with a particular virus. They software may remove it without the host knowing or alert the host and ask to clean the computer to get rid of the virus. Can anti virus software do anything else? Yes it can. Some pieces of software can prevent click fraud. This is where a malicious piece of software records credit card numbers or other personal information. Anti virus software will increase security for your computer to stop this fraud from happening.